Anyone who has ever spent any time around the former political columnist Tommy Denton knows that he has little patience for today’s ‘sound-bite’ media culture and little tolerance for an uninformed citizenry that doesn’t do its homework in electing public officials. I have recently reconnected with my old college classmate whom I met when we were both journalism students. Denton is now retired from the newspaper business after his tenures at the Philadelphia Inquirer, Ft. Worth Star-Telegram; and most recently, the Roanoke Times. However, his retirement hasn’t stopped his passionate mission to keep the essence of traditional journalism alive. He has been an articulate spokesman in the past in promoting the goals of a free press which offers reasonable and civil debate in the political process. Denton will be participating in the annual presentation of the Minority Writers Seminar this month at Vanderbilt University in Nashville. He was one of the founders of the seminar, which has been sponsored for the last 17 years by the National Conference of Editorial Writers Foundation and the First Amendment Center Freedom Forum Diversity Institute. Many of the participants in the upcoming Minority Writers Seminar are either independent bloggers or multimedia directors for newspapers or broadcast stations. Some have been laid off by their employers and are looking for a network to make it into a paying job. Denton has continued his plea for a rational dialogue that has seemingly been lost amidst all the noise and bluster of angry commentators. In our current divided political climate, He warns of the consequences in a working democracy when we fail to show proper respect for opposing opinions and ultimately let intimidation rule the debate. Tommy Denton may be retired from active newspaper work these days, but his purpose remains clear, and it still drives him to help others practice the craft in constructive ways that embrace many of the traditional standards in which he was taught. There may be great challenges for today’s political writers in the current no-holds-barred media circus, but Denton seems committed to maintaining a higher journalistic purpose without relinquishing the cause for educated and civil debate. 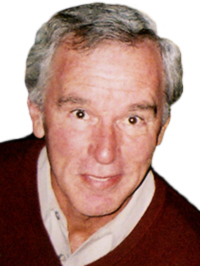 Bob Vickrey is a freelance writer whose columns have appeared in the Houston Chronicle and Ft. Worth Star-Telegram. He is a member of the Board of Contributors for the Waco Tribune-Herald and a contributor to the Boryana Books website. He lives in Pacific Palisades, California.